Hi everyone. Have I told you lately that I am so lucky to have you in my life? ❤︎ I am thankful for each and every person in our fabulous crafty community. Each and every reader, watcher, commenter and follower makes what I do so rewarding. 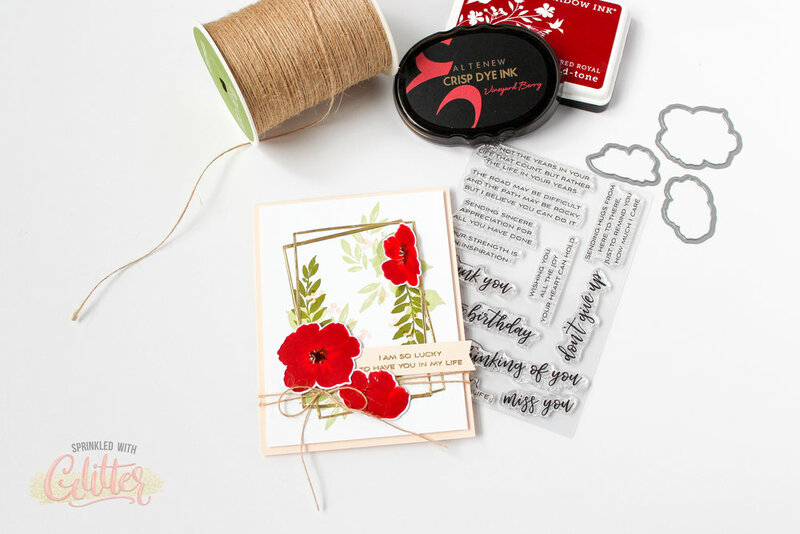 Today, I’m celebrating the wonderful crafty community, along with Altenew and a whole bunch of other friends with a Crafty Friends Blog Hop. I knew when I started making videos (back in the day) that I wanted to share with others and give them the confidence to create wonderful creations of their own. I didn’t know how many of those people would in turn touch my life. I am very busy, and often can’t find the time to reply to every comment, but I read them all. And the kindness and love I have received from everyone in this community makes every busy day worth it! Today’s project is dedicated to all of you out there…the creators, the designers, the manufacturers, the bloggers, the followers, the subscribers….everyone who makes this industry so wonderful….and YOU are a part of that. I’m so lucky to have you in my life! I’ve included a video walking you through today’s card project. Be sure to check it out. If you want to watch this video in HD on my YouTube channel, click HERE. Don’t forget to like, subscribe and turn on the notifications while you’re there! There are several photos in the gallery below, so be sure to use the arrows to scroll through them. There are so many wonderful designers on this hop. To start from the beginning, you can head over to the Altenew Blog. If you’ve come to me from Vicki Boutin’s blog, you’re hopping right along. Your next stop is Agnieszka Malyszek. Hop along for more inspiration, and more chances to win the fabulous prizes listed below. In additon, I will also be giving away a $20 Altenew gift certificate here on my blog. That’s a lot of prizes! Be sure to leave comments by Sunday, December 9th, 2018 for a chance to win! 37 winners will be chosen at random from the comments left on all of these blogs listed below and will be announced on the Altenew Card Blog and Altenew Scrapbook Blog on December 15th, 2018. I will contact the winner of the $20 Altenew Gift Certificate from my blog directly. Thanks for stopping by today. I hope you’ve enjoyed today’s project. Until next time, I hope you have a fabulous day!